This post is not about church music in any way. I hope that is alright. I am looking to purchase a practise piano for my children. We have an upright piano, but with a large family comes a need for practising in silence, especially when practise times get longer. I think that a digital piano would sometimes fill that need. I am completely confused as to what to stay away from. I would prefer not to spend a lot of money. All suggestions are welcome! There is an array of pretty good keyboards by several manufacturers which some here may wish to suggest based on their experience. But one thing you would need when the instrument is to be used as a practice piano, it should have 88 keys and these should be fully weighted. I would highly recommend Yamaha. They have a decent sound and seem to be quite reliable. They are not the cheapest ones on the market. I use a Yamaha for the same reason (I am not an organist, just taking piano lessons but need to practice quietly). The keys feel similar to a real piano. I went to a piano store and tried a few models. Mine is the P-105. Ditto on the Yamaha. I've had one for 20+ years and it's served its purpose well. I am the first child of 12. All of us have taken piano lessons and the piano ran just about nonstop for many years as each of us put in our scheduled practice time. THANK YOU for giving your children this gift. We bought a Yamaha P60 in the mid-2000s. 88 weighted keys, something I would gig with happily. Yamaha have not changed their basic sound generation system at all in the last 15 years; if you could find a used one of those series (IIRC P60, P120, and a few others with P-preface) they will be as good as the Yamahas currently on the market, tough, and light (36 pounds). However, it didn’t end up getting used much for serious practice; more for messing around and playing the occasional gig to supplement my lawn-mowing money. Eventually your children will get to the point that a digital piano will not be adequate for practicing what they are trying to learn. Things like achieving true legato with the pedal, voicing chords such that one note predominates, or playing a melody with the thumbs while the other fingers accompany, are impossible to do on a digital piano, since they depend on gradations of movement too minute to be picked up by the sensors, on the exact distance left between the damper and the string, or on the resonance of neighboring unplayed strings, none of which any digital piano has the ability to produce. It may be cheaper in fact to pick up another upright from Craigslist or such and move it to a garage or other remote part of the house, than to buy a digital piano which they will eventually outgrow if they continue to play into high school. It may also prove difficult to set up the keyboard at the same height as the piano, with the pedal in the same place, which would enable bad posture and make it hard to maintain good habits. Gamba, very interesting! Actually I only have two children interested in piano (possibly three), and everyone plays strings. Sometimes it's about me plunking out notes for the string players or rehearsing accompaniments when the young ones have gone to sleep, which I haven't been able to do so far. I found two baby grand pianos for sale within a 100 km radius of my home. I am looking into these as well. I wonder if they are any good though since they are being given away at $500 and $700 (Canadian - cheaper than the digitals). A grand would help me see those I'm accompanying. As others have said, the important thing is the action, and Yamaha is one of the better choices. I would also like to put in a good word for Kawai. In 2011, we bought a CN-37 for our rehearsal room. The action is very good and the key covering material is something I had not run across before. While synthetic, it is not the usual slick, glossy plastic one often finds. It feels closer to natural ivory. The piano has held up well. You might also check out the forums at forum.pianoworld.com. They have a sub-forum on digitals. I know I have a very strong opinion about this, but I would never have a child learn anything on a digital piano or any digital instrument. Learning to control the mechanics is crucial to dynamics and developing a good touch. There is another alternative. Install a practice bar for much less than buying an electronic instrument and will serve the same purpose while keeping the children practicing on a real instrument. Forgive my ignorance, but what is a "practice bar?" That, it seems to me, would be a lounge or a pub where one practices the piano. what is a "practice bar?" It's the specific location a choir proceeds to after one and a half grueling hours of woodshedding. Haha that sounds about right! I experienced a hybrid upright Kawai a few years ago at a music store in Memphis—you could engage or disengage the hammers and it had a sampled sound that was unmistakable from the actual strings. The action was the same regardless of which system you used, and truly felt like a piano. I’ve never felt a weighted keyboard that felt like a piano, personally. Might be worth looking at. I think this question is best answered with a budget in mind. There is a lot to choose from but no sense recommending something you can't afford. Is this perhaps a bit of complimentary hyperbole? I have yet to hear a simulated organ or piano whose sound, upon close listening, I could not determine was being generated by speakers instead of by winded pipes or hammered strings. Even if one absolutely could not tell the difference there remains the objective fact that, like a plumber wearing pontifical garb, it is false and isn't what it sounds (looks) like. I think that some people actually want to be fooled - or even enjoy being fooled. And this is not a diatribe against Canadash's quandry - just a statement of objective fact. Well-meaning people often buy instruments and later wonder why. An acquaintance bought a Steinway grand for a son who wanted to take piano lessons. That expensive instrument has sat there ever since young lad reached puberty and began a life dictated by hormones. He never learned to play. CharlesW, yes it is true. But my kids play and make a lot of noise...music...all.day.long....lol! but it doesn't have built in speakers. To set the record straight, I despise the piano, do not use one at church, and do not use one at home. I did not take piano lessons prior to studying the organ, and hate playing the piano when I have to. To me—when I tried the instrument—the sampled sound was identical to that coming from the strings. Your mileage may vary. That you point out it’s fakery, I point out that the original post requested something that can be played without being heard beyond the performer. As the touch of weighted keyboards is so different from that of a traditional piano, I thought offering an option that retained the traditional mechanism would be less bad—along with allowing it to be used without electronics when possible. My earlier recommendations on Yamaha come from having to buy a replacement for a dead Roland. I talked to as many pianists as possible, then bought the Yamaha for the loft to be used for weddings. You all know how I feel about weddings. LOL. This is a practice bar. It is simply a rod with a piece of felt attached that is engaged with an old fashion choke cable with a simple pull lever. People mentioned Yamaha already. More specifically, look at their "Portable Grand" series. Several years ago I went shopping for a digital piano. I thought for sure I would get a Yamaha Portable Grand. I ended up coming home with a Casio Privia. So... Look into that one. Excellent key feeling and reasonably realistic sound, at a lower price than Yamaha of similar quality. @canadash -- what did you decide to buy? Do you like it? If you're still looking, my advice would be to get a new one in the 2K-4K (US) range or a used one that retailed for twice that when it was new a few years ago. That would get you a piano with a key action that is two or three generations old. But there is a difference in the digital pianos marketed for home use vs. stage use. If you don't care about the case or stand (and maybe already have amps/speakers), you may be able to get a good "stage digital" piano for less--but not the low end models which often don't even have 88 keys, much less a fully weighted key action. Generally on the subject of digital pianos, I have an opinion and a question. I was once a piano major and have played piano since I could reach it, by way of background. So here's my opinion: Digital pianos have come a long, long way in the last couple of decades. I was once firmly in the "children should not learn on them" camp for the usual reasons, especially touch. I have converted to the other side, based on one fundamental fact: most digitals today, of almost any price, are superior to bad console uprights, or even bad big uprights, and sometimes even to bad baby grand pianos. I sincerely believe that most, possibly all, of my friends and relations who had a console-sized piano growing up and who took piano lessons and quit long before they learned enough to be considered musically literate would have stuck with their lessons longer if they had had the kind of comparatively inexpensive digital pianos available today. My reasons are: (1) the touch is better than a bad acoustic piano; (2) they never go out of tune; (3) they have fun stuff built in. Further but less important reasons are: (1) headphones; (2) learning tools; (3) even more fun stuff. Of course in an ideal world parents would buy decent acoustic pianos, keep them tuned, and get involved in lessons. But this isn't an ideal world. Within a few decades those awful console pianos will be extinct (no one is making them anymore), and good riddance. I have been researching new digital pianos myself recently to replace my beloved and very fine five foot upright that was destroyed in a flood. Unfortunately I am now living in a small apartment and need a digital for the usual reasons (budget, space, etc.). I would specifically like to know if anyone has an opinion on the new 2019 Roland LX708 or 706, especially as compared to the Kawai CA98 / 88 / 78. I've recently played the LX706 and am very impressed. If you're already familiar with the Roland LX17 and/or LX7, the new models have a fully re-engineered touch with longer keys, a fully re-engineered "physical modelling" (algorithmic) system for four grand piano variations (two European and two American), and redesigned cases that look like a studio upright. I could tell the difference when playing it compared to the 603/605, which has the same key action as the LX17 (which was puzzling because at the time I did not know that the new models had redesigned keys and touch). The Kawai, which I haven't yet had a chance to play, has longer and fully wooden keys that have a functional pivot point (which sounds better on paper but may not be in practice) with more moving hammer parts (ditto). The Roland LX706 retails for less than 5K US, so about the same or even less than a new console-sized acoustic used to cost IIRC. Has anyone had a chance to play both of these models side by side? I thought about trying to find a decent used grand for about the same price and replacing my bed with a futon mattress (or perhaps just a sleeping bag) on the floor under the piano so I'd have room for it. The digital piano seems like it is probably a reasonable compromise. Hi Cecilia! Thanks for the great info. We actually got a great deal ($250 Can) on a Yamaha. I forget the number, but it got decent reviews on the site (AZ) that you mentioned. I bought it second hand and the lady was so very sweet and chose me because of my plea on kijiji. It is working very well for us! That's terrific! I'm so glad you got what you need (and a great deal!) and I hope your kids find it fun and rewarding to play. Considering that Monsieur MJO, after reading the first paragraph, is probably on the floor in the throes of a paroxysmal seizure let me mollify my comments. I, too, have never been at peace playing a digital organ. To make a living I’ve kept my mouth shut and played them when asked, but never have I felt that favorable comparisons to pipe organs were justified. The newer technology employed by digital piano companies is far more impressive, particularly in the bass range, but if intending to play a piano concert I would never choose a digital instrument. They are meant for the home. There are pragmatic factors, however, explaining the lure of the new hybrid models. If you’ve ever lived in an apartment in New York City, Boston or Philadelphia, you will immediately know that practicing Prokofiev’s 2nd Concerto for five hours a day will not make happy neighbors. Now that grand piano touch has been approximated, I’m told Juilliard students are now among the customers of the newer digital models. Wanna practice at 2 am on an instrument taking a fraction of the space of a grand? Just put on the headphones. Randolph, I'd be very interested to hear your opinions of the models I mentioned compared to the Yamaha. The unbranded dealer I went to didn't even carry the Yamaha, telling me straight up that the Roland was the only one they recommended for serious trained players. (I suspect that that was probably correct up until fairly recently, but might not be true anymore as all of the latest-generation key actions by the major manufacturers seem to be significant improvements over the previous ones.) The new Roland model was really remarkable. 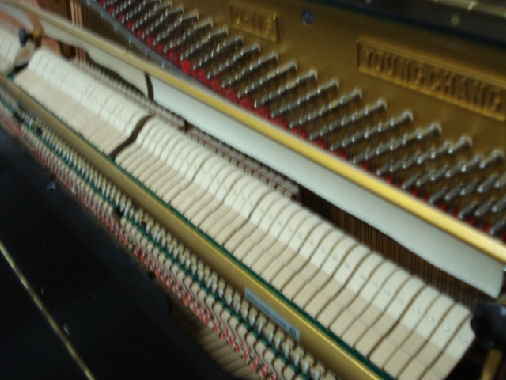 The four pianos used as the basis for their modelling are only identified as European and American 1 and 2 respectively. I am not sure which brands they are but People-on-the-Internet have come to their own conclusions. The remaining 150+ sounds were all sampled, not modeled. I thought the organ sounds were pretty disappointing, but then I was looking for a baroque pipe organ sound and couldn't find one. I can only relate my own experience. We had, for weddings - not mass use - a rather expensive Roland. When it started having issues, I found that parts for older models are hard to get. Some Rolands are rather uniquely constructed and parts are not standardized among models. Yamaha, on the other hand, has standardized parts that are easy to get. They appear to be more easily repaired, so the techs tell me. That is good information. Would a ten-year warranty have made it easier to deal with? Because that's what they're offering now. If you get a warranty and the dealer/repair techs are likely to be around in 10 years, then yes. I have a Rodgers organ in my home and the warranty has expired. The local dealer folded and there is no replacement. Fortunately, I don't need service. But if I did it would have to come from 250 miles away. I am just mentioning this as an example. Warranties are only as good as the local people behind them.